Newly consolidated into a single event, the Great Campaigns of the American Civil War tournament thrived at WBC 2005. Total attendance across all GCACW was up by 10%. The number of participants in our Wednesday teaching session and the number of commanders in our Long Roads to Gettysburg multiplayer campaign game (a whopping 13) both set all-time highs. 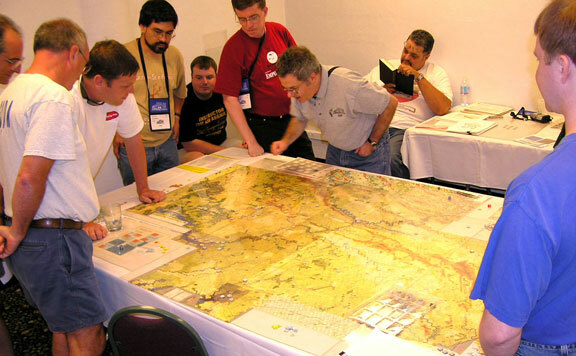 The Long Roads to Gettysburg demo was hosted by the designer of that module, Ken Lee. With such a surplus of generals, Ken was promoted off the battlefield, serving only as a staff officer in Stanton's War Office for much of the game. The Union commanders used the new addition of strategic movement effectively, marching north to block the Potomac crossings before Lee's army could arrive. The decisive contest occurred at Harper's Ferry. Ewell's corps charged forward into a Union trap. Without Stonewall Jackson's leadership, the II Corps was pinned against the confluence of rivers. Their destruction late that night won the game for the Union (after well over 100 commander-hours of play). Thursday morning brought the start of the GCACW single elimination rounds, and attendance in these games remained strong all day. The16 players in the Seven Pines round set a record for recent years. At the end of the day the Union and Confederacy had tied with 13 wins apiece; Chris Withers and Steve Likevich (the only players with three wins for the day) took top honors and advanced directly to Saturday's quarterfinals. The other six slots wouldn't be determined until the next day. Friday's rounds were smaller, losing players to the For The People and March Madness tournaments. Once again three wins advanced you to the quarterfinals, with Dave Cross and Ed Beach being the day's triple winners. Ed's only loss came at the hands of Ken Lee in one of the weirdest tournament games ever. Fighting out the battle of Fort Stevens, Ed launched a succession of attacks on the Washington, DC fortifications. Ken rolled a 6 in defense each time, winning our shortest scenario without having to move a single unit! Saturday's single elimination rounds featured the scenarios Battle of the Wilderness, Bethesda Church, and Bloody Spotsylvania, all from Grant Takes Command. Our Rookie-of-the-Year, James Sulzen, fell in the Wilderness round to Chris Withers, while our Risen from the Ranks award winner, Rod Coffey, lost to Ed Beach. Former champ Paul Nied succumbed to Steve Likevich, but PBeM ladder champ Rob Doane was able to upset Dave Cross. The semifinals featured a rematch between Ed and Chris, who had battled it out in Finals for the past two years.